Belt dimensions: 60L x 22W in. Overall dimensions: 72.22 x 33.87 x 57.1 in. 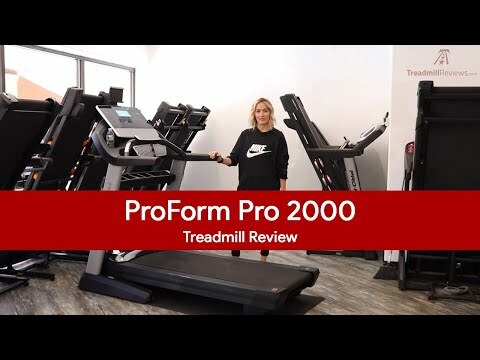 Take your cardio workout to the next level and beyond with the ProForm Pro 2000 Treadmill. Featuring a powerful 3.5-HP motor with a ProShox lite Cushioning Deck and digital quick speed electronics with incline adjustability from 0-12 MPH, EKG grip pulse, a wireless chest strap, and a Coolaire workout fan, this extra wide yet compact treadmill with a belt size of 60L x 22W in. is designed to give you the workout you’d pay to get at the gym – and so much more. The 7-inch oversized backlit LCD display provides your time, distance, and speed so you can keep track of your progress. The rest of the dashboard is easy-to-use so that you can easily make adjustments and while you’re running. It’s iPod, iPad, and smartphone compatible, and its audio input (with two 3-in. speakers) allows you to play your workout playlist without the need of connecting headphones, and it’s also iFit compatible. The 18 preset workouts will keep you busy no matter the fitness level you’re at, and this unit folds up easily for quick and smart storage when not in use. Includes manufacturer’s lifetime warranty on the frame and motor, 5-year warranty on parts, and a 2-year warranty on labor. About ProForm Synonymous with treadmills, ProForm had revolutionized the treadmill industry with the now world-famous SpaceSaver fold-away design. Thanks to cutting-edge advances in cushioning, electronics, and reliability, ProForm’s treadmills have become the overwhelming choice of fitness enthusiasts throughout the world. Manufactured by ICON Health & Fitness, ProForm continues that tradition of quality and innovation even today. Not content with just producing the world’s finest treadmills, ProForm has introduced a complete line of exercise bikes, elliptical machines, weight benches and more – all geared to provide the most effective workout available. Belt dimensions: 60L x 22W in.. Overall dimensions: 72.22 x 33.87 x 57.1 in.. Features a powerful 3.5-CHP motor.